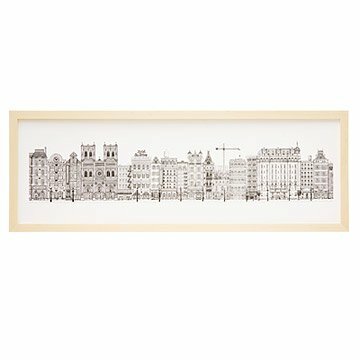 This intricately drawn print by Jason Watkins gives a charming measure of metropolitan to your wall. The skyline had to be drawn somewhere. Luckily it was at this intricately drawn giclee print featuring a collective city street, as interpreted by artist Jason Watkins. Using fine-tip pens, it took Jason--who has had a lifelong fascination with cities, architecture, and how people live together--more than 120 hours to create the piece, which includes a mix of buildings inspired by extant architecture and close renderings of actual structures. Made in Milwaukie, Oregon. Jason Watkins grew up on a ranch in rural New Mexico, where the tallest building was only two stories and there was only one elevator in town. Despite that, or probably because of it, he has had a lifelong fascination with cities, with architecture, and with how people live together. After practicing print journalism for 17 years, he’s now “retired” and spends his time teaching design and drawing highly detailed works of art. Meet Jason on our blog.